Robin Barnes Railway Art and History. 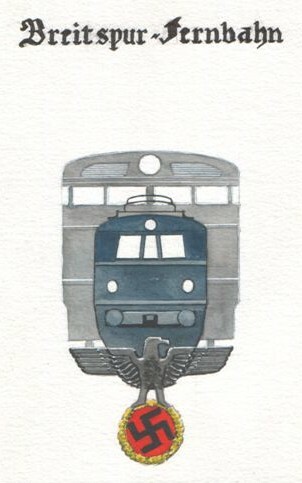 Internationally acclaimed Railway Artist. The broadest track gauge to see commercial employment was Brunel's 2.14 metres, conceived by him around 1833 and in everyday use on Britain's Great Western Railway, albeit on a gradually reducing scale, until 1892. At its peak it totalled 2296 km, but even it would have been placed firmly in the shadows had Adolf Hitler's dream of a 3 metre gauge 'Breitspur Fernbahn' (Broad gauge long distance railway), reaching from Brest on France's Atlantic coast, through Germany proper, to Kasan, Stalingrad, Baku, and beyond, ever come to fruition. Additionally, its rails would have extended southward from München and Wien to Spain and Italy. Great Britain was to be excluded; there would have been no Channel tunnel (Map, Fig 2).